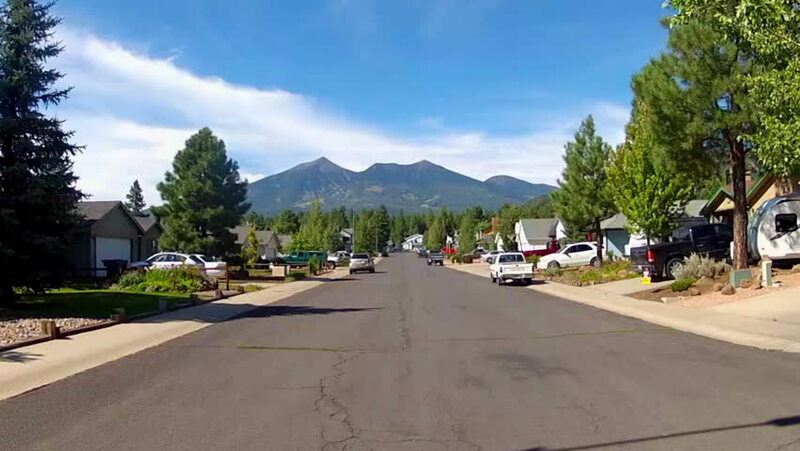 FLAGSTAFF, AZ/USA: August 31, 2014- A wide shot looking down a street in a residential neighborhood with Mount Humphreys and the San Francisco peaks in the background circa 2014 in Flagstaff. 4k00:10An establishing shot of a typical Arizona-style residential neighborhood. hd00:15A wide shot of a town with cars and people. Camera pans to the right in slow motion. hd00:12TUSAYAN, AZ/USA: August 1, 2017- Wide shot of the Grand Canyon National Park Entrance with cars. Clip reveals vehicles waiting to enter popular attraction.